As you will see from Brian’s ‘searching for a tone of gold’ articles part 1 and 2, he is the one doing the trail blazing! I was getting pretty left behind still playing my Lowden F32, and PRS/Mesa Boogie MKIV combination. It’s not just a question of sound, but the way the instruments respond. The voodoo of the gear was wrong. It has been a pleasure of mine for the last couple of years to pop in to see Seamus Brady at vintageguitar.co.uk, based in Norwich (you might remember him from the old days when The Acoustic Centre first set up in Wapping?). I was in there one day chatting chatting, when on the wall I spied a Martin HD28. It’s only 12 years old, but it’s seen some use! And it had some Johnny Magic about it. I could hear Bob, and I could hear Neil, and to be perfectly honest I could hear myself. I took it home to see how I got on with it (Seamus is a nice bloke), and rocked my kitchen, and Bad Fogged my music room. I played it to Brian and he said ‘If you don’t buy it, I will’. I really try not to be competitive, especially with my best mate Brian, but that was the point I had to buy it!!! I haven’t played my Lowden since. I love the head room of the Martin, and I love the fact it just works. So the worm was turning. 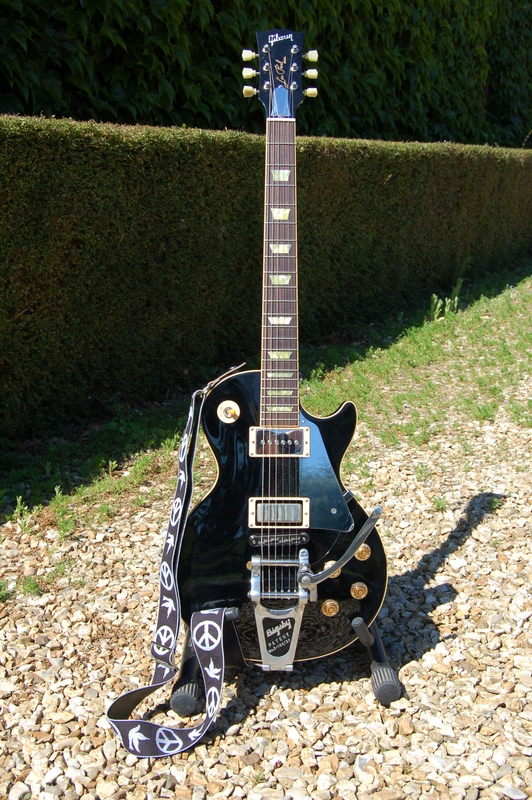 I have always fancied an Old Black replica, I mean who reading this hasn’t? 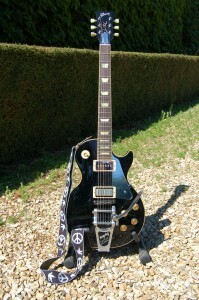 One morning I popped into town and there hanging on the wall (damn those walls) was a Les Paul Classic reissue 1960 in Ebony. Okay I know this isn’t the real deal, but it is black. The chambered body makes it light and the tone really vibrant. And I liked the neck straight away. Actually it’s not much like other Les Pauls I’ve played at all. More like a tele, if you’ll believe me. So after a little business it became mine to vandalise. Fit the Wilkinson roller bridge – ouch, I know purists, I just want it stay in tune as much as possible! Fit mini switch to facilitate the ‘firebird straight to the jack’ mod. Ice pick. So then there was the amp issue. I had started messing with a Fender reissue tube reverb unit, a Fender Super Champ and a Rodenberg Overdrive Pedal (in fact this is what I used on the Harbour Room live recordings, check out Like A Hurricane particularly), and I reckon I was starting to get a good sound, but by comparison with Brian’s vintage and home made amps the Super Champ sounds so small. 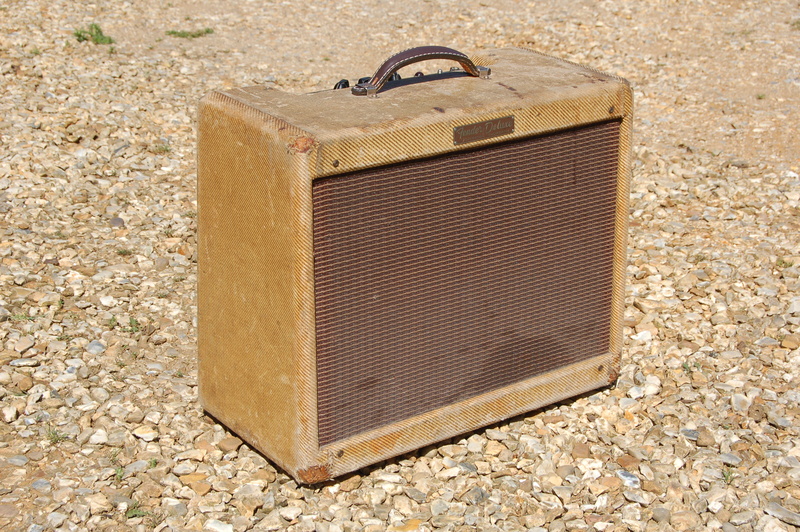 I was just thinking this when Brian tipped me off about an original 1959 Tweed Deluxe for sale in London. so I had no choice 😉 This amp is amazing. 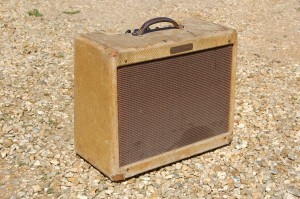 It is simply the best and most musical sounding amp I’ve ever used. And it certainly looks 50 years old. 0 comments By Mark on June 2nd, 2009 @ 4:03 pm.